Here are the feedback of satisfied clients! Thanks a lot for organizing a fantastic tour for our family last Friday in Brescia/Franciacorta. – What do you think about franciacortatour.com website? Are the packages and the proposals -clear? The website was very well designed and everything about the different packages was clear. – How your experience was with assistance during the booking process? Booking was very easy and fast…especially since we did this on short notice. – Did you enjoy the Franciacorta area and the wines? It was a beautiful area and a wonderful set of wines! – How did you evaluate the wineries and the restaurant selected for you? Both the wineries we visited were wonderful! I would go back to either if I were ever in the area again. Really, superb! – What do you think about the assistance during the day tour? Wonderful and better than expected. Keep up the good work. – Do you have any suggestions to give us to improve ourselves? Overall this was a wonderful experience that we won’t forget. I don’t think you need to change much. Perhaps trying to find a winery that pairs their wines with the different lunch courses would be better than going to a separate place for lunch? Just a thought. Thank you for everything and we hope we can come back to that Franciacorta sometime soon! We have a general comment that we are very pleased with the Tour, we have met interesting, knowledgeable people and learned a lot about the laborious wine industry. We will definitely return to this very nice area again. Your website is very good and we are very pleased with all the information we have received, and the gorgeous wines from your area. Thanks again for very interesting day. Certainly, I had a great time while visiting some vineyards with my husband. Franciacorta not only has great sparkling win but unique people like you, knowledgeable, professional and kind. We have booked a wine-tasting-tour to Franciacorta with Marco and Roberto. They have been really helpful in suggesting good ideas for our trip. We are very pleased with the highquality services they delivered. My husband and I had a great experience with Franciacorta Tour. Leading up to the tour, the company was very responsive and helpful with planning. On the day of the tour, they arrived to pick us up right on time in Milan in a private car. Within 1.5 we kicked off things at our first vineyard of the day, followed by lunch, and then another vineyard. Everything was executed perfectly, and the wine/lunch included in the tour was amazing! Highly recommend this tour for anyone staying in the area. Thank you planning such a fabulous day in Franciacorta! I loved it!! Marco spent the day with us and shared his obvious passion, respect and love for all things Franciacorta and Lombardia. Planning was seamless and nothing was too much trouble for Marco and Roberto. The day itself was outstanding. The winery choices by Marco were exactly what we were interested in. Lunch was fresh, tasty and more than sufficient. The drive was relaxed and allowed conversation to flow; no question went unanswered and Marco found time to share in the history, sights, and sounds of this amazing region outside the standard tour. A walk on the edge of Lake Iseo, gelato in hand a great way to end a wonderful day. If you want to explore, taste and immerse yourself while staying in or near Franciacorta (day trips from Milan possible too) then definitely consider Marco and Franciacorta Tours. I had nothing but first class assistance throughout in planning and experiencing my stay to see the piers and look at some ancient rock carvings/pictures. I have to say Marco is the best tour guide I have ever dealt with hands down! I stayed in Milano for a couple of nights with two friends and decided we were going to go to Brescia to visit a couple of wineries they had in that local area. We found Marco online, briefed him on what we wanted to do and within 15 minutes he had set up an itinerary for us that lasted a whole day. He drove us around and showed us monuments and a beautiful lake nearby Brescia. If you are looking for a tour guide that will get you into exclusive wineries and show you around Brescia, Marco and Roberto are who you should contact. We were taken to the Christo “walk on water” construction … the entire trip having been managed by Marco … from inception to conclusion. Marco was attentive, caring and knowledgeable. We have retained his contacts and will use him and recommend him. With the help of Franciacorta Tour we DID walk on water, i.e. On the FLoating Piers of Christo on the Lake Iseo. Franciacorta Tour’s Marco has taken us to the lake and back , introduced us to the region which is lovely. Took us to a hotel , Casa Adea, which with its stunning view was a discovery. They were Inventive, professional, and a very good company during our short but enjoyable visit. Marco, representing the company was very helpful, generous and ready for all adventures. High recommended if you are in the area! Great custom tour for us! We were not that interested in the sparkling wines but we wanted to see the old architecture and interesting parts of the region as well as do a couple of wineries just to get a feel. They picked the perfect places for us, we loved our lunch and all of it! Thanks! We had a great time on the Franciacorta Tour. From the beginning booking was easy and Marco communicated the reservation and payment. Roberto guided us to a winery & a grappa distillery. The tour included a full course lunch at a local restaurant. I had booked a special tour for the floating piers where Roberto brought us out to. I felt that Marco & Roberto did a great job of going out of their way to create a good experience for someone visiting a little area of Italy. Thank you Marco! I found the ways in which you assisted me in having a marvelous experience was over the top and would be glad to recommend your assistance to someone else. 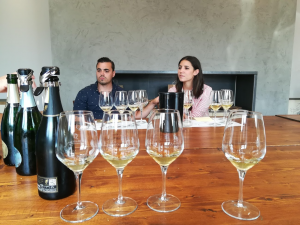 Myself and a group of 4 other friends stayed in Milan for a few days and decided that we would incorporate a wine tour in Franciacorta into our itinerary. We corresponded with Marco a few weeks before we left and set up the tour. He gave us a great list of places that we would go and said that he would be our driver for the day as well. We took the train from Milan out to Franciacorta and met with Marco who picked us up in a tour van to begin our journey. We ended up going to see three different wineries, two much smaller with a family ownership that just specialize in making VERY good wine, and another larger operation (still delicious) to give us something to compare the others to. Our tour took the better part of the day, and I wouldn’t have changed anything about it. As part of the tour Marco took us out to Lake Iseo (which was BEAUTIFUL) and we took the ferry out to the island and grabbed some drinks. I would recommend this tour to anyone who plans on travelling the region and wants to taste some truly delicious Italian wine and experience the countryside without breaking your bank. Marco was an awesome tour guide and I wish him the best on all future tours. I plan on returning sometime in the next couple of years with my fiancee to relive the experience. Thanks for the tour Marco!! The area and the wines are very good, go there!